The concept of Open Space originated from Harrison Owen in the 1980s. 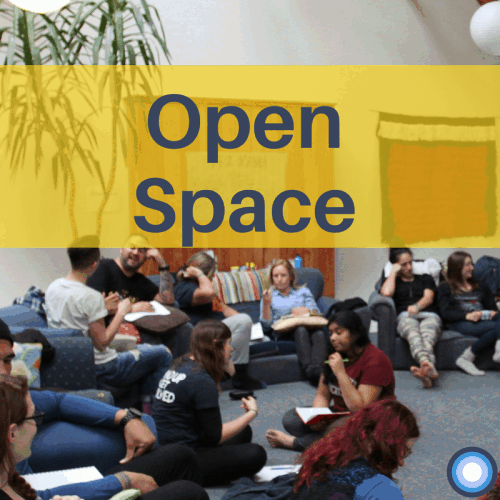 Open Space is an opportunity for people to host sessions about topics that they are interested in. Facilitators work at the front end of the session to timetable perhaps two or three concurrent sessions (depending on your numbers) and then participants are autonomous to participate how, where and for how long. We deliberately have used Open Space in programme design as a opportunity for participants to synthesis their thinking, stop and consider their next steps or to focus on their own wellbeing. In the resource below we’ve included a runsheet or how-to guide for those of you wanting to run your own open-space.